Look! Up in the sky! It’s Donald Trump… and Ted Cruz… making out?!? 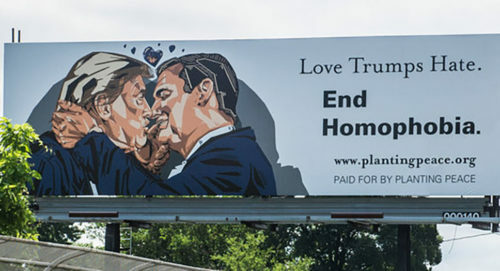 The president of the nonprofit behind the billboard, Planting Peace, told the Huffington Post it’s a direct response to what’s been described as the most anti-LGBTQ platform ever drafted by the GOP. The billboard is about five minutes from the Quicken Loans Arena where the convention will be held, and the platform voted upon and adopted by delegates. The HuffPost reports this isn’t the organization’s first political billboard, having planted one each in North Carolina and Mississippi after those states enacted anti-LGBTQ legislation. Planting Peace was also responsible for Equality House, a rainbow colored home directly across the street from the Wichita, Kan. headquarters of the Westboro Baptist Church.